For the first time, students from the Kakenya Center for Excellence visited the U.S. this March. 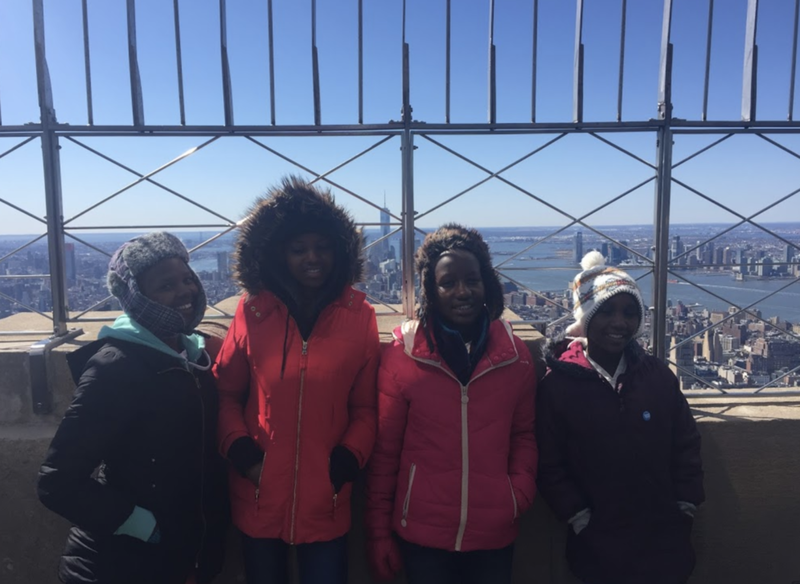 Eighth-graders Felisters, Elizabeth, Rahab, and Mary arrived in the U.S. on March 11, accompanied by program manager Moses and program officer Daisy. From leaving their homes in Enoosaen to arriving in Washington, DC, they traveled for more than two days! 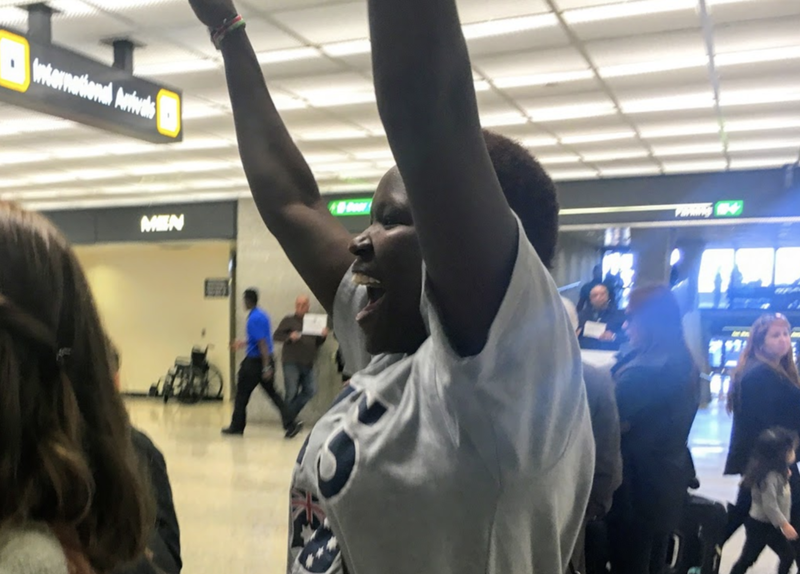 The girls are reunited with Kakenya at the Dulles International Airport in Virginia. In Kenya, the temperature rarely dips below 55ºF/13ºC, which made the chilly, often below freezing temperatures in Washington, DC and New York a big adjustment for the group. After a whirlwind shopping trip, the girls were outfitted and ready to head up to New York City. The group boarded a train, accompanied by U.S. staff members Merrit and Jolena, and took the trip to Penn Station. Thanks to the generosity of our partners at Whitby School in Greenwich, CT and Montessori Model United Nations (MMUN), Felisters, Elizabeth, Rahab, and Mary participated in a life-changing Model United Nations. Helping to represent China and South Korea, they contributed to resolutions on supporting people with disabilities and protecting indigenous rights. They prepared for months, outside of their ordinary coursework, for the experience. Our favorite delegates are ready for their first day at MMUN! On the last day, the girls visited the United Nations Headquarters with the rest of the MMUN participants for an energizing closing session. In just a few days, the girls had made new, life-long friends and engaged in problem-solving dialogues with fellow students from around the globe. After MMUN concluded, the girls saw the Statue of Liberty and visited the Empire State Building. For the rest of the trip, they all kept saying the highlight of NYC was seeing the view from the top! Taking in NYC on top of the Empire State Building! Even though they were having all this fun, the girls still missed parts of home . American food was not quite a hit — what is the deal with eating raw vegetables, anyway? — and, of course, the climate was also an adjustment. They also said they missed their friends, and wished that they could be also be experiencing all of these exciting new things. After a few days in NYC, the fun continued in Washington, DC. The girls spent a day exploring the National Mall, learning about Abraham Lincoln and Martin Luther King Jr. Visiting the memorials sparked conversation about human rights and being an agent of change in one’s community. The girls impressed everyone with their thoughtful comments and passion for change. In Washington, DC, the girls also saw snow for the very first time. It was a cold and wet snow day, but the girls made the most of the experience! They played outside, ran races in the snow, made snow angels, and built a snowman. The girls build their first snowman! In New York and Washington, DC, the girls had the opportunity to meet many of their biggest supporters. From Katonah, NY, visiting the Katonah Education Exchange Program (KEEP), to the home of one of the U.S. board members in DC, where they met some of the organization’s earliest donors, the girls shared how support for their educations changed their lives for good. These interactions were positive, powerful, and passionate, with lots of laughter and a few happy tears too. When asked about their trip, the girls raved about the tall buildings, the “big screens” in Times Square, their new friends, but most of all about what they are taking home with them. “I learned about supporting people with disabilities and [indigenous] rights at Model UN, which I can share with my classmates” says Felisters. For Rahab and Mary, who both want to be pilots when they grow up, taking their first trip on an airplane was an especially inspirational experience. “I want to be a pilot someday, and now I’m closer to that dream,” says Rahab. This life-changing trip would not have been possible without the support of our visionary partners and donors like you. Please contribute today to support our life-changing programs for all our girls. Can’t get enough of the girls’ adventures? Stay tuned for more updates, video, and photos from their visit!